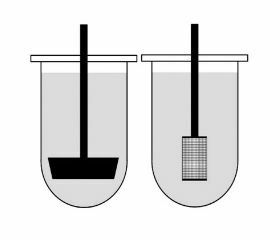 Baskets and paddles both are used in tablet dissolution test of pharmaceutical dosages forms but both of these have considerable difference. When a drug is ingested orally, it takes some time to dissolve in the stomach and get absorbed by the body. The rate at which the drug dissolves inside the stomach affects the drug's concentration in the blood as it gets absorbed. If it dissolves too fast it may cause an over-dosage, and if it dissolves too slowly it may cause an under-dosage. Pharmaceutical companies strive to ensure that the drugs they produce are manufactured in a way that they get absorbed at a rate that will ensure optimum effectiveness of the drug in the body. Before the drugs are released to the market, they must thus go through rigorous absorption tests in a laboratory to verify how the final product will get absorbed after ingestion. Two of the most widely accepted ways to perform such tests are paddle dissolution testing and basket dissolution testing. Both these methods are carried out in a transparent dissolution vessel with a rotating shaft immersed into it to agitate the drug and dissolve the drug with the liquid inside the vessel. The rotating speed of the shaft and temperature of the liquid in the vessel is precisely controlled to simulate the conditions inside the human stomach. The time taken to fully dissolve the sample is then recorded for scientific analysis. The paddle dissolution and basket dissolution methods, however, have unique differences in the way they are carried out. These differences are outlined below. In this method, the rotating shaft is fixed to a blade attached vertically at the end. This blade is meant to act as a stirrer to mix the drug being tested with the liquid inside the holding vessel. Typically, the drug is placed inside the holding vessel and once it settles at the bottom, the rotating shaft is switched on to begin mixing. The drug being tested is also frequently attached to a sinker to prevent the drug from attaching itself to the vessel walls and also to ensure the drug being tested remains positioned beneath the rotating shaft. This sinker is made from a non-reactive element to prevent it from reacting with the drug sample it holds. In the basket dissolution method, a different apparatus is placed at the end of the rotating shaft. This apparatus is called a basket. It is cylindrical in shape and is constructed from non-reactive mesh to prevent any unwanted chemical reactions that may alter the final result. The pores in the mesh allow the dissolving drug to move from the basket into the holding vessel, creating a uniform solution. The drug being tested is first placed inside the basket that is firmly attached to the end of the rotating shaft. Once the drug is securely in place, the motor is switched on and the shaft begins rotating the basket inside the vessel. The sticky tablets containing HPMC or similar compounds as a binder are tested using a basket because tablet swells in water and may stick to the walls of the dissolution vessel. The nature of the sample being tested – whether it is a coated capsule, non-coated pill or emulsion will determine which of these methods will be used for testing it in the laboratory.